^ Climate Prediction Center. Frequently Asked Questions about El Niño and La Niña. National Centers for Environmental Prediction. 2005-12-19 [2009-07-17]. （原始内容存档于2009-08-27）. ^ El Niño Information. California Department of Fish and Game, Marine Region. 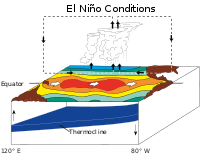 ^ Climate glossary - Southern Oscilliation Index (SOI). Bureau of Meteorology (Australia). 2002-04-03 [2009-12-31]. ^ Trenberth, Kevin E.; Hoar, Timothy J. 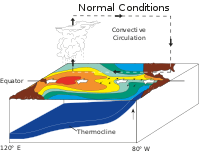 The 1990–1995 El Niño–Southern Oscillation event: Longest on record. Geophysical Research Letters. January 1996, 23 (1): 57&–;60. Bibcode:1996GeoRL..23...57T. doi:10.1029/95GL03602. ^ Wittenberg, A. T.（2009）, Are historical records sufficient to constrain ENSO simulations?, Geophys. Res. Lett., 36, L12702, doi:10.1029/2009GL038710. ^ Fedorov, Alexey V.; Philander, S. George. Is El Niño Changing?. Science. 2000, 288 (5473): 1997–2002. Bibcode:2000Sci...288.1997F. PMID 10856205. doi:10.1126/science.288.5473.1997. ^ Zhang, Qiong; Guan, Yue; Yang, Haijun. ENSO Amplitude Change in Observation and Coupled Models. Advances in Atmospheric Sciences. 2008, 25 (3): 331–6. Bibcode:2008AdAtS..25..361Z. doi:10.1007/s00376-008-0361-5. ^ Merryfield, William J. Changes to ENSO under CO2 Doubling in a Multimodel Ensemble (PDF). Journal of Climate. 2006, 19 (16): 4009–27. Bibcode:2006JCli...19.4009M. doi:10.1175/JCLI3834.1. （原始内容 (PDF)存档于2007-07-04）. ^ Meehl, G. A.; Teng, H.; Branstator, G. Future changes of El Niño in two global coupled climate models. Climate Dynamics. 2006, 26 (6): 549. Bibcode:2006ClDy...26..549M. doi:10.1007/s00382-005-0098-0. ^ Philip, S.; Van Oldenborgh, G. J. Shifts in ENSO coupling processes under global warming. Geophysical Research Letters. 2006, 33 (11). Bibcode:2006GeoRL..3311704P. doi:10.1029/2006GL026196.